Large Wooden fair trade skittles hand painted in bright colours. Made from sustainable rubber wood and measure 20cm high. This set contains 6 skittles, 3 balls and a bag. 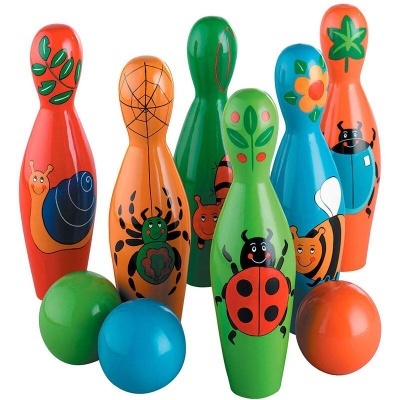 Lanka Kade's fair trade wooden minibeast skittles set is beautifully handcrafted from natural rubber wood. This traditional game is popular with children and adults alike, and comes complete with a storage bag for safe keeping once the game is over.